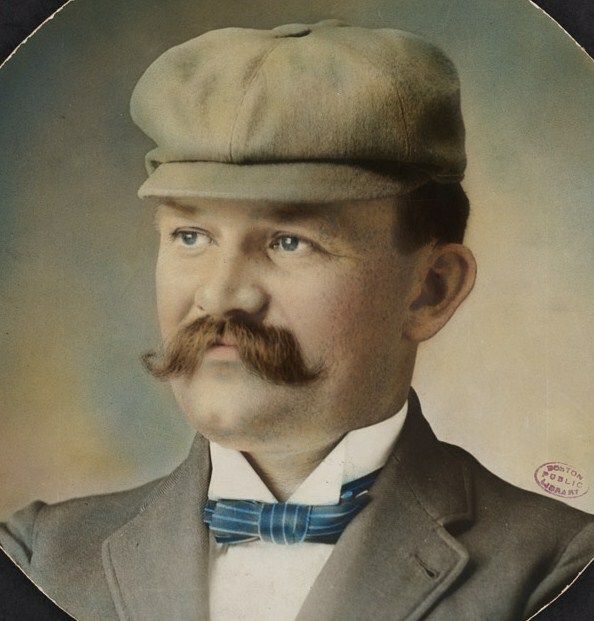 McGreevy, the founder of the raucous Boston fan club known as the Royal Rooters, has been recognized by many as the most famous baseball fan of all-time and one of baseball’s first true collectors. He showcased his collection in the tavern, which also served as the headquarters for his Royal Rooters and Boston players like Hugh Duffy and Babe Ruth. Before there was a Baseball Hall of Fame, McGreevy’s saloon was the closest thing there was to a baseball museum accesible to fans. 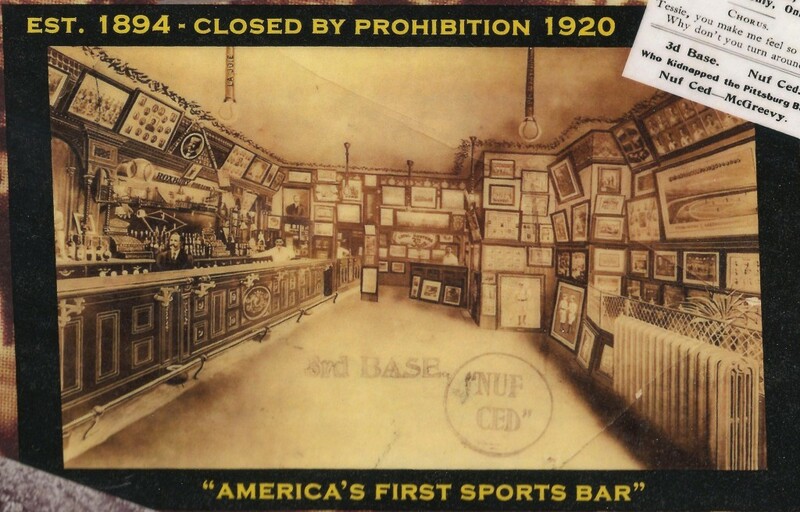 This photograph shows the interior of Nuf-Ced McGreevy's 3rd Base Saloon c.1906 and the scores of rare baseball pictures that adorned the walls. The light fixtures were constructed from game-used bats of Boston baseball legends like Cy Young and "King" Kelly. Nuf Ced’s collection, along with the A. G. Spalding Collection at the New York Public Library, is considered one of the greatest assemblages of early baseball photography. But since McGreevy intended to share his collection and make it accesible to the public for viewing, the treasure trove became the target of opportunistic theives. Unfortunately, the photograph of “Nig” Cuppy and nearly sixty other valuable photographs once owned by “Nuf Ced” vanished from the library at Copley Square sometime between 1978 and 1981 as the victims of a well-orchestrated heist. Several of the missing items are large team photos sized approximately 24 inches by 16 inches. A few weeks ago, nearly thirty years after its disappearance, Paul Dunigan Jr. was given the missing cabinet photo of “Nig” Cuppy by his mother, who found it in her attic in Lowell, Massachussets. 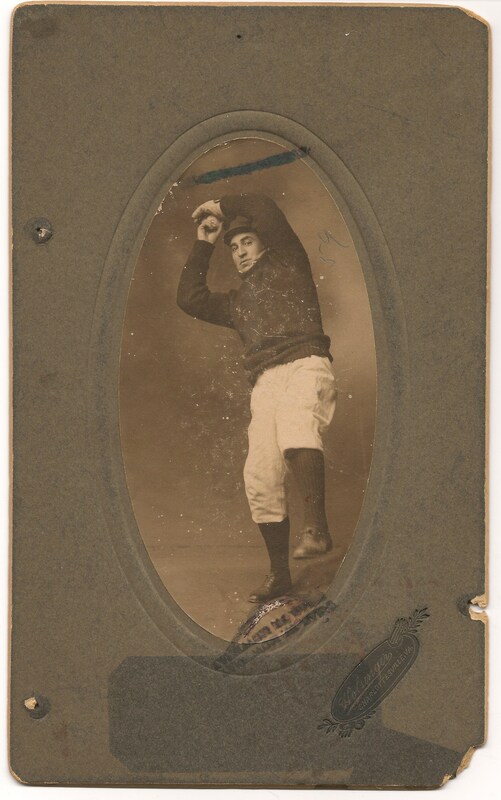 Dunigan then listed the photo with some other miscellaneous antiques on EBAY as a generic, “Vintage Early Baseball Player Photograph Pitcher.” Dunigan only mentioned that the name “Cuppy” was written in pencil on the reverse. Collector David Maus, of Cedar Rapids, Iowa, took note of the photograph he recognized as being taken during the Red Sox spring training trip of 1901 by the Holsinger Studios of Charlotesville, Virginia, and thought he had a bonifide ”steal” when he placed the winning bid of $66.00. But when he recieved the photograph in the mail he noticed some familiar marks and notations on the photograph and referred to the Haulsofshame.com website to view items that had been previously recovered by the Boston Public Library. Comparing his purchase to other items produced by Holsinger Studios, Maus soon after realized that the photograph he’d purchased might be one of Nuf Ced McGreevy’s long-lost treasures. The BPL’s ownership stamps had been defaced and concealed with black ink and other stamps designed to deceive anyone examining the photograph. This BPL McGreevy Collection photo of Ossie Schreckengost was not stolen from the collection and has its BPL stamps still in tact. We confirmed Maus’ concerns that the Cuppy photo was a stolen item and included on the BPL’s “missing list” and then contacted the library’s “Keeper of Special Collections,” Susan Glover, to arrange its return. So, how did one of McGreevy’s rare photos end up in an attic in Lowell? Dunigan confirmed that his father had purchased items in his collection from the late New York Yankee owner and collector, Barry Halper, and that it was possible the photo could have been acquired from the Halper Collection, which has been linked to a host of stolen institutional artifacts. After Halper’s death in 2006 his wife, Sharon Halper, experienced a similar situation when she discovered several rare photos in her house that turned out to be stolen from the BPL’s McGreevy Collection. Barry Halper's widow found this stolen and vandalized BPL McGreevy Collection photo in her house after her husband died. 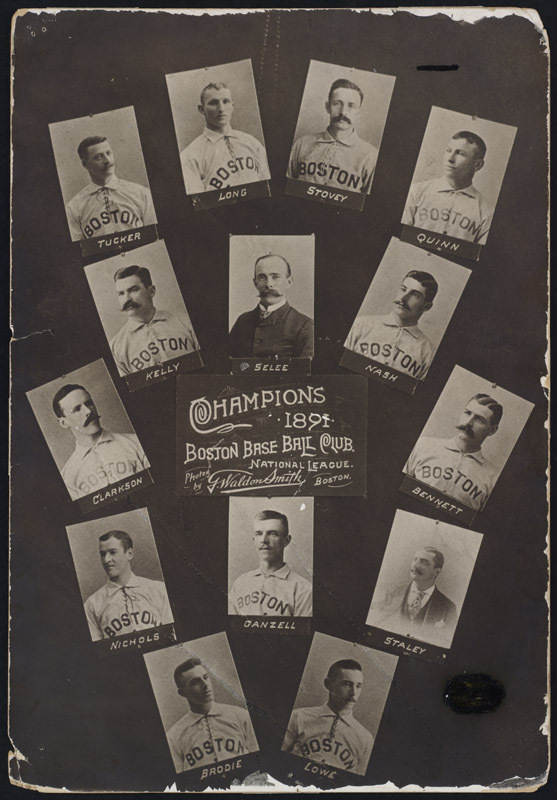 Halper’s widow consigned large photographs of the 1891 Boston and the 1882 Buffalo teams to Robert Edward Auctions in 2007, but this writer reported the items, which displayed similar vandalism to conceal the BPL marks, to Aaron Schmidt of the library’s Print Department. Schmidt subsequently recovered both items from Halper’s widow. Halper sold his collection at Sotheby’s in 1999 for over $20 million and included several other items stolen from the BPL and other institutions that still had their library ownership stamps visible. Despite publicity and heightened awareness of the fact that the items are stolen, the purchasers have still not come forward to return the missing photographs to the library, as collector David Maus has. Thanks to Maus, Nuf Ced’s Cuppy cabinet photo is now close to finishing a Field of Dreams-esque journey from Boston-to-Iowa and back. A formal return of the photo to the BPL is being scheduled at McGreevy’s reconstituted 3rd Base Saloon at 911 Boylston St. in Boston. McGreevy’s helped the BPL recover another one of their missing photos in 2009. The rare photo of heavyweight champ John L. Sullivan and Red Sox third-baseman, Jimmy Collins, is currently on display at McGreevy’s. 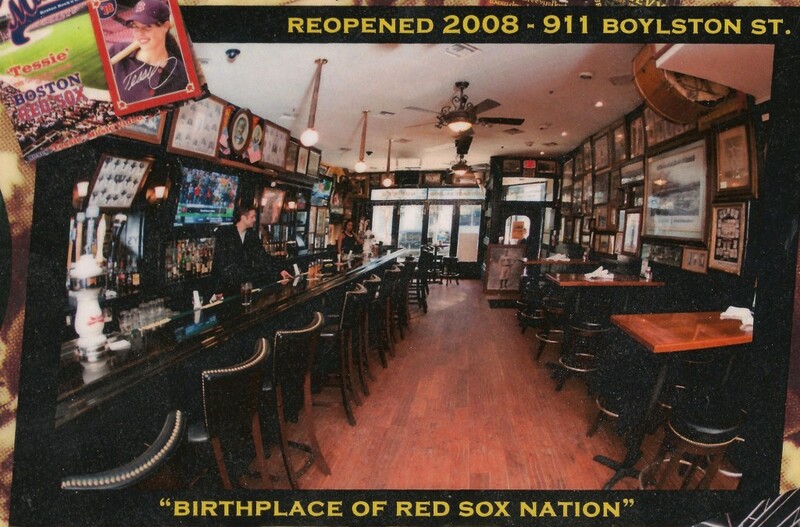 Nuf Ced's missing photo will be returned to the BPL in the modern-day 3rd Base Saloon at 911 Boylston St. Re-established in 2008, the bar is a faithful replica of McGreevy's original shrine featuring reproductions from the BPL and other original photos from McGreevy's era. Back in 1984, the BPL’s “Keeper of Prints,” Sinclair Hitchings, and veteran collector Bob Richardson successfully recovered nearly twenty of McGreevy’s stolen photos that had surfaced for sale at baseball card shows and in collector magazines. Since the year 2000, the BPL’s Aaron Schmidt, who was recently transferred away from the McGreevy Collection to another department because of library budget cuts, spearheaded several more recoveries of McGreevy original photographs. Thanks to these in-house efforts, without the aid of a security staff or the resources of law enforcement, only about 36 of McGreevy’s treasures are still missing. With David Maus’ discovery there’s another one down, and just 35 to go. Hi Peter, What a tremendous selection of recovered items that we as a community in Boston are very happy to know that they will be returned to our historic Boston public Library. I, and my family and friends, are very proud to call you our friend and to see all the hard work you are doing on behalf of the BPL. God Bless You! You are a wonderful person as well as a top notch BB expert! Your Friends in Framingham, Mass~~~~ Bill Hedin and Family/Friends! Great news, Peter. It’s terrific to know these items will be back where they belong — with someone who cares about maintaining Boston’s rich baseball heritage. Somewhere Nuf Ced is smiling and raising a mug in your honor again. Long live the Boston Nationals! if only all collectors were as astute and honest as david maus. David Maus…An honorable man..Nuf Ced. I didnt even have to start reading this article and when I saw the word ” STOLEN “, Barry Halper,s name popped into my mind and low and behold, further down in the article, there his name was.Now, you dont think Mr. Honest would lower himself to such deeds as stealing, !!!!!???????? This site has great content. Love reading. Wonderful news, Peter. Gives me a warm feeling. It’s nice to see something being recovered. The more I read about Barry Halper the more truly sickened I am by the depths he sank to for the sake of expanding his collection and duping people. Thank the lord for people like David Maus, who is obviously a very different kind of collector, and person. Nig was my great,great uncle. My mother died ,she had saved the travel trunk that nig used. Inside it was a uniform and his cap. Unfortunately, my brother burnt it all up to get rid of it. But thank you for this info. It Is very well appreciated.